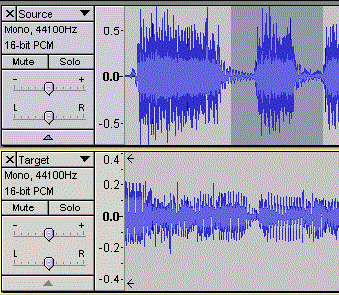 Audacity helps you to copy and paste a section of aduio. 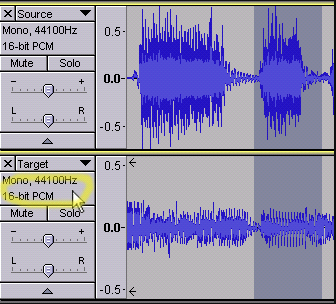 Copying and pasting a section of audio from one track to another is a useful way to paste the good sections of one take over the bad sections of another take. 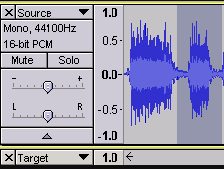 First of all, you have to use the Selection Tool The Selection tool to select a section of audio from the source track. If you want to make this sure that what you selected includes exactly the section of audio you wanted, you can simply use zoom tools found under the View menu to zoom in to the beginning and end of your selection and select the exact samples you want. 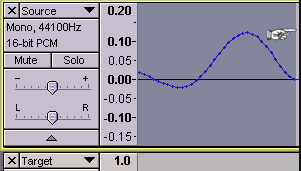 To avoid “popping” sounds in your final audio track, try to select a section of audio that starts and ends at the 0.0 line. 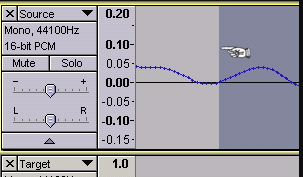 It is advised to select a section of audio that ends at the 0.0 line as well. Now you got a well-formed selection, you can easily copy and paste it to the target track. You can copy the selected by pressing Crtl+C. Hold the Ctrl key and click in the Track Control Panel of the target track with the channel, rate and format information. This selects the target track without changing any of its controls and extends the selection into the target track. Then Ctrl-click in the Track Control Panel of the source track to deselect it. And press the shortcut Ctrl + V.
Posted in Updates	Tagged Audacity, Audio, Copy/Paste, Guide, How to copy and paste a section of audio?